Styled with the running short , logo high ankle and the perfect slides. I am a self proclaimed hoodie junkie. This is hands down the nicest hoodie I've ever owned. I think people's definition of "oversized" is definitely down to personal preference, as I did not find it oversized at all. I ordered a small based on what other people had said and found it to fit very nicely. I love an oversized hoodie so I ended up returning it and getting a medium. I will say, THIS THING SHRINKS. Do not make the mistake I made and put it through the dryer. The customer service team was so incredibly good to me and got everything sorted out. I learned my lesson and will definitely hang to dry from now on. Will definitely purchase again. For many years I was purchasing the full zip hoodies made by TNA in solid colours. They were great sweaters because they were super thick and comfortable. They stopped making them and I was honestly pretty devastated. Then they came out with The Perfect Hoodie and the other Perfect pieces. The materials are thick and warm. I love to wear mine at home, to work, wherever. I love the length of it, it doesn’t feel like any old hoodie. I purchased in black. Will buy more. I accidentally left it in the dryer on a medium heat and it only shrunk a tiny bit. Nothing noticeable. I would recommend going up one size. Without a doubt, the PERFECT hoodie! Hands down, the best hoodie ever made. It fits bigger than usual (I’m usually a medium, but I bought a small in this hoodie), as its over-sized. However, even though I sized down, ’ it still looks slightly oversized, which I like. Spring Green on the Go!!! The color is great, and it a wonderful look for Spring! Love the style and fit. That hoodie is very warm and comfortable!! Super soft and comfy. It is the perfect hoodie and love the color choices. Like this color and bought the second one. stained easy. faded after one wash. but loved the hood! I have three perfect hoodies all in different colours, as they are a stable in any wardrobe. They are comfortable, beautiful and quality can be seen. I have washed them many times and have seen no difference except for the inside being the slightest bit less soft (happens to all fleece material) compared to when I first bought them. Still wear them after two years and will continue to do so. Order the same size as normal. Brought the white so cute love it!!! Lives up to it name! This is the best hoodie I’ve ever purchased! I’m going to order it in more colors immediately! Another win! 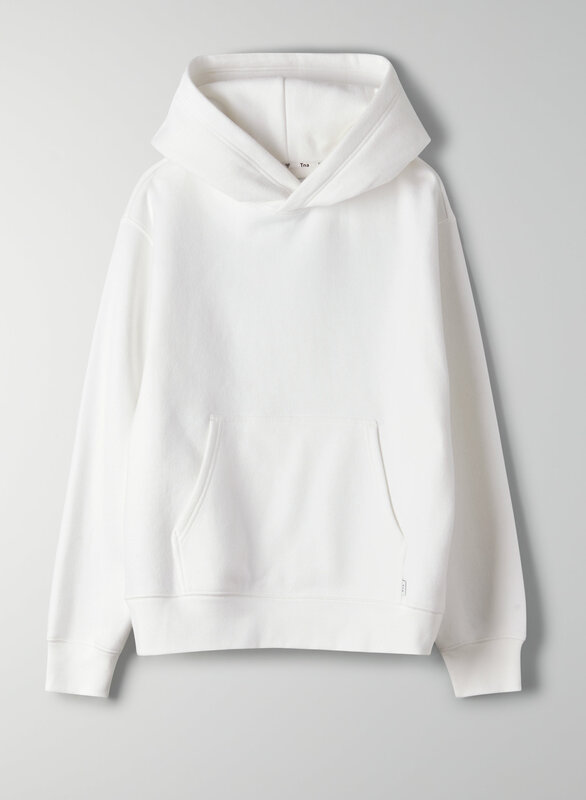 A warm, cozy hoodie with enough room all over, but not oversize or sloppy. I am very happy with the sleeve and body length as well. The hood is nicely functional and not excessive. The dark cocoa colour is a gorgeous dark mauve/grey, not really that brown. Soo comfy, live this hoody! Canadian winter no match for this hoodie. I went for a small (I’m 5 ft 7 and 130lbs) and its still roomy and SO SO comfortable. The deep blue color is absolutely gorgeous and I’m considering that I’ll have it for 5+ years so it’s worth the expense. Great for layering in winter for the coldest days! Cozy, comfy, and the perfect thing to throw on whenever you need an extra layer. I got mine in Bisbee blue which is this obnoxiously bright colour, but I love it even more because of the shade. My friend introduced me to this piece and I’ve become obsessed ever since. I have two, both in size small, but one of them is slightly smaller than the other so I’m not sure if they’re sized differently. You will definitely not regret purchasing one, though! It’s actually perfect. I’m 5’5 125 lbs and usually wear a small in most styles. Bought this in medium for a cozy boyfriend fit and I’ve been living in it since it arrived.. Love it. Love the crossover on the neck where the hood attaches rather than laces.. Truly is a perfect hoodie. So comfortable and soft. Fits true to size without being too fitted or boxy. Will be ordering in another colour! It is awesome quality. Thicker and fit really well!! Would recommend it forsure! I was looking for a regular hoodie so I went to TNA, tried this on and knew I had to buy it. So I got the red one for myself in XXS, it’s beautiful, cozy, warm and really perfect. It is so good I bought a blue one for my husband, and he is crazy for it. I love it,happy with the purchase! I ordered this in cocoa and am in love with it. I’m usually a small-med and ordered a medium. I prefer more room so the medium is perfect for me. Will be buying more colors! Love this hoodie, look forward to purchasing more in the future if I ever see a colour I want available. Size up if you're tall and want a functioning hood. I'm 5'9 and the hood is a bit small. I would probably size up next time to see if that helps avoid the issue. Otherwise, I love it. My favourite lounging around the house piece yet! Fits perfectly. I love wearing it under my stedman wool coat. I got the light blue color in a medium and the fit is perfect! There’s room to move around and it’s not a tight fit to the body which is perfect for me. I’m usually a size 6-8 or S-M for hoodies and M was better. Great for the chill outfit but you won’t look like a slob. I have three of them. Comfortable, well made, hangs well, fun colours... I wear them all the time. They really are the perfect hoodie. This hoodie is perfect under any winter coats. Warm and comfy! Should have gotten a M so that it was not so snug, great sweatshirt though! my friend has three of these in different colors because she loves them so much. i wasn’t disappointed when i bought my own. 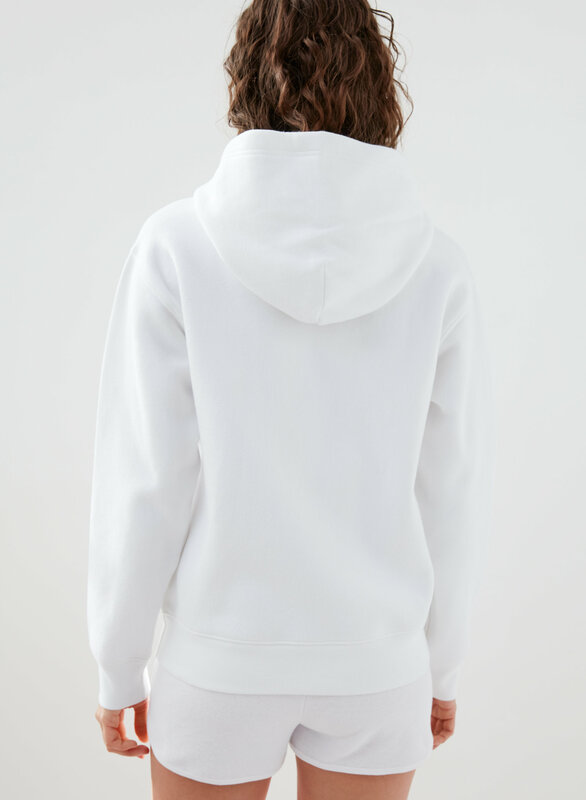 the sleeves are long, the material is thick, and the hood is big. i love! This is such a cute sweater, in-line the way it fits. And it’s so soft! Incredibly comfy and perfect fit!